Home furnishing store Window Story operates within Singapore’s 112 Katong shopping centre, at 112 East Coast Road. 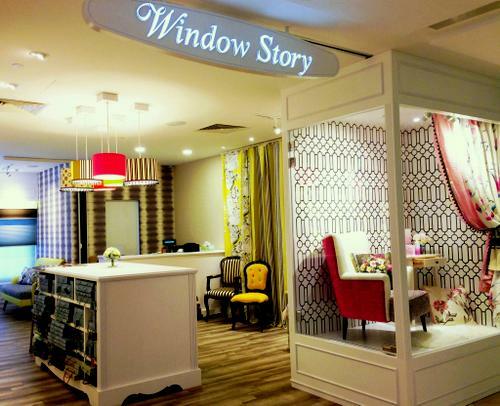 Window Story is a home furnishing retailer that specializes in soft furnishings, providing both off-the-rack solutions as well as bespoke decor for your living spaces. The company helps bring inspiration and beauty into contemporary living so that your home tells your unique story with the right furnishings and touches of creativity into the finer things in everyday life. Window Story’s team comprises of passionate master weavers, designers, and craftsmen who are able to ensure a high level of workmanship with creative thought. The fabrics are hand-picked primarily on three key criteria – Durability, Aesthetic Appeal, and Diversity – and sourced worldwide from Europe, Asia, and the Middle East, ensuring that the customers only get the finest quality of materials. Visiting the shop, you can purchase from the main categories including curtains, blinds, Hunter Douglas products, reupholstery, customized sofas & ottoman, customized bed heads, window films, and wallpapers. The official Facebook page for Window Story is available at www.facebook.com/windowstory112/. You can also follow the official Window Story Instagram account, which in turn is located at www.instagram.com/windowstory112/.